2014 has been a great for classic automobiles, with many rare vehicles hitting the auction blocks, spurring massive interest, and changing owners for millions of dollars. In the United States alone, the biggest market for vintage cars, collectors spent no less than $1.3 billion in 2014, up from $1.2 billion in 2013. It remains to be seen whether 2015 will see a new all-time high, but it seems as if the year is off to a great start with Gooding & Company having raised more than $26.9 million at its annual Amelia Island Auction. The auction house joined the 2015 Amelia Concours d’Elegance with no fewer than 85 cars, managing to sell 76. Seven of them sold for in excess of $1 million, while 13 set new world auction benchmarks. Highlights included several Ferrari, Porsche, and Mercedes classics, as well as plenty of race cars dating back to the 1950s. As usual, the cars that changed owners for the most moolah wore Ferrari badges. Continue reading to learn more about Gooding & Company’s Amelia Island Auction. With so many Ferrari having sold for more than $10 million in recent years, it’s far from shocking that the Amelia Island Auction saw four Maranello-built cars fetch in excess of $1 million each. A 1967 275 GTB/4 was the most expensive of the bunch, changing hands for $3.3 million, followed by a 1961 250 GT Series II Cabriolet, which sold for $2.09 million. A 1991 Ferrari F40 was the third-most-expensive vehicle auctioned at $1.62 million, a massive improvement over the 1989 example that sold for $87K in 2014. Amelia’s million-dollar-car list was completed by a 1963 Mercedes-Benz 300 SL Roadster ($1.27 million), a 1957 Mercedes-Benz 300 SL Roadster ($1.23 million), a 1974 Porsche 911 Carrera 3.0 RSR ($1.23 million), and a 2011 Ferrari 599 SA Aperta ($1.15 million). This year’s Amelia Island Auction also saw 13 new world auction records being established. Both the aforementioned 1974 Porsche 911 Carrera 3.0 RSR and the 2011 Ferrari 599 SA Aperta sold for more than $1 million for the first time ever, while a 993-generation Porsche GT2 set a new benchmark at $973,500. Other record-setting highlights included a 1974 Ferrari Dino 246 GTS ($561,000), a 1997 Porsche 993 Turbo S ($440,000), and a 1994 Porsche 964 Turbo 3.6 ($330,000). Racing enthusiasts had several exhibits to bid for as well, with the lucky ones taking home vehicles such as the 1990 AAR/Toyota Eagle HF89 ($660,000), the 1951 Lotus Mk IIIB ($247,500), and the 1985 Penske-March 85C ($231,000). Needless to say, Amelia Island Auction helped various iconic cars to find new owners to maintain and showcase them at events across the nation. While it’s no longer shocking to see Ferraris go for million of dollars, it’s interesting that 964- and 993-generation 911s are starting to fetch close to $50K these days. They might not be as expensive as the Ferraris of the same period, but the fact that they’re gaining on the Italians says a lot about the heritage surrounding the 964 and 993 Porsche 911s. On the other hand, I’m surprised that the Penske-March 85C that helped Al Unser win the 1985 CART championship sold for only $231,000. Gooding & Company, the distinguished auction house celebrated for selling the world’s most significant and valuable collector cars, realized more than $26.9 Million at its annual Amelia Island Auction. 76 out of 85 lots were sold with an 89% sell through rate, resulting in an average price per car of $354,831. The auction, which included an exceptional assemblage of exciting barn finds and unrivaled super cars, was led by the top selling 1967 Ferrari 275 GTB/4 (sold for $3,300,000) and the 1961 Ferrari 250 GT Series II Cabriolet (sold for $2,090,000). Out of the 85 cars offered during the auction, seven sold for values in excess of $1 million. High points of the day also included the 1974 Hector Rebaque-Café Mexicano 1974 Porsche 911 Carrera 3.0 RSR (sold for $1,237,500) and the exclusive 1996 Porsche 993 GT2 (sold for $973,500), two highly limited production examples of the iconic 911 series. Also featured was the exemplary 1932 Lincoln KB Dietrich Custom Stationary Coupe (sold for $836,000), an outstanding testament to an iconic marque with a captivating presence as one of only three still in existence. Gooding & Company substantiated top sales across a variety of marques and finalized the day with 13 newly set world auction benchmarks from major brands including Porsche, Ferrari, Mercedes-Benz and more. Gooding & Company’s next sale, The Pebble Beach Auctions, will take place on August 15 and 16, 2015, at the Pebble Beach Equestrian Center. 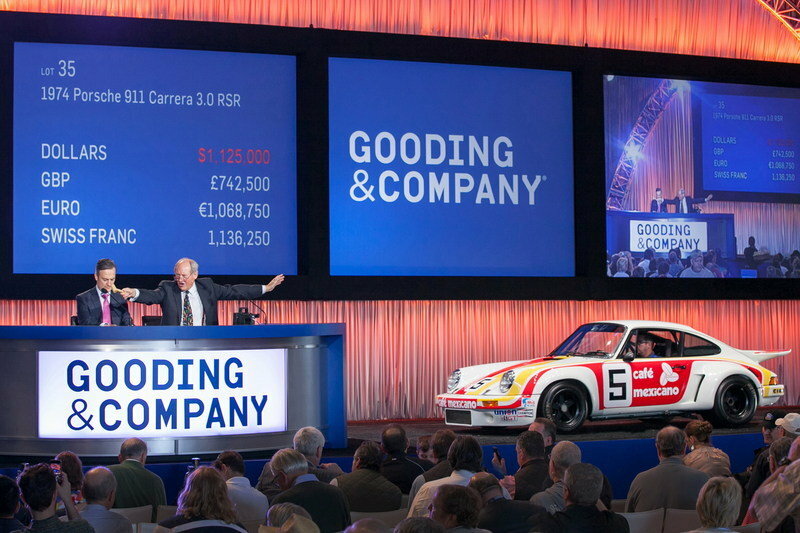 The notable 2014 Gooding & Company sale provided memorable cars breaking several world auction records and a total of 107 stunning cars fetching $106 million in overall sales. As the official auction house of the Pebble Beach Concours d’Elegance®, Gooding & Company is revered for showcasing the finest classic, sports and racing cars on the world’s stage.